The health care system is a complex environment with many needs and policy choices. It can be difficult to know where to focus attention – particularly in a fiscally challenging time such as we are now facing. This was one of the reasons that the Alberta Medical Association created albertapatients. I was very interested in the survey results that follow below in this January newsletter issue. They will help us to determine what topics we will discuss with you in the months ahead. That's important because the whole intent of this website is that you would decide what gets discussed here. 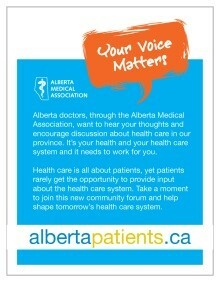 Additionally, however, the Board of Directors of the AMA receive regular updates on the activity in albertapatients. Your concerns and insights will increasingly can support our decision making – particularly as the membership of albertapatients gets larger. Very soon the group will be large enough that it will be statistically valid to apply the results to the entire population of Alberta. One of our objectives is to make it known that albertapatients is the place where patients can express what matters to them. To that end, we will share our results from surveys and discussions with other stakeholders, for example, Alberta Health, Alberta Health Services, the Health Quality Council of Alberta, the College of Physicians & Surgeons of Alberta and others. I sincerely thank you for your participation and your thoughtful responses and insight. In the months ahead we look forward to more exploration of the things you have identified as your discussion priorities. We hope to bring you a chance to participate in discussion moderated by experts in the various subject areas. It should be interesting and valuable. In December, we asked albertapatients members to help guide our plans for the coming months by prioritizing the most frequently suggested and discussed topics we've received. Please read on to the Did You Know section (below) to find out which topics were ranked highest priority by those who participated in our survey. albertapatients Top Priority Topics. Did You Know? Most members agree that addressing wait times is a top priority. Seniors' care is also top of mind for many of those we heard from. Members are interested in exploring five categories of questions, aspects, and issues surrounding seniors' care: facilities and home care; unique medical needs; financial concerns; understanding and navigating seniors' supports; and quality of life. The survey responses mainly focus on issues surrounding long-term care facilities and seniors’ medical, physical, mental, and emotional needs, but many respondents shared interest in and/or concerns about home care and alternative care situations. We also heard that the network of seniors’ supports and resources is confusing and difficult to navigate, resulting in underuse because Albertans are not getting the information they need. Issues surrounding emergency rooms are the third priority for albertapatients. Members' specific questions, aspects, and issues related to emergency rooms fall into five broad categories: access and use; wait time; management/communication; comfort and safety; and effects on patients. The survey data suggest divergent points of view about how emergency rooms are being used - those who feel ERs are being abused due to lack of patient education, and those who feel they are overburdened due to lack of alternatives. There are also concerns about the criteria used to prioritize cases at triage, monitoring and re-prioritization, the respect and compassion shown to patients, the efficiency of ER staff and procedures, wait time communication, and patient comfort/privacy. Read more details about these topics (opens in a new browser window). If you would like to make comments, share feedback, or suggest an area for further research, Let Us Know.